You can grab a cab at the airport and taxis are available in Troncones. There are a number of car rental companies located at the airport, it is best to get your car rental online before reaching Zihuatanejo. We have also worked with a private business man Gustavo who rents cars and provides taxi service to our place. He is reliable and reasonable. 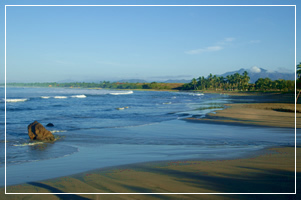 Follow highway #200 for approximately 35 kilometers from the airport to Troncones. From the airport travel on highway #200 towards Zihuatanejo/Ixtapa on highway #200. Driving through Zihuatanejo on #200 there is about a half dozen lights. Just past Zihuatanejo the highway will climb a large hill towards Ixtapa, just before Ixtapa, at the top of the hill take the right highway #200 exit towards Lazaro Cardenas. Continue following highway #200 until the Troncones turn. Once in Troncones follow the road until it comes to a T just before the ocean turn right and then it is about 4.5K to our resort. (There is only one main road in Troncones). The garden casa two story house is next to the road with a wooden sign on it and we also have a sign next to the road by our entrance gate. Our email address is or phone +522 755.553.2807 (Mexico) / +1 218.252.2382 (USA) if you have any questions. Raul, our manager will return your call.